Mike Sweeney of FishDuck.com was at the Hatfield-Dowlin complex on Friday covering week one of spring practice for the Ducks where sophomore offensive lineman Tyrell Crosby expressed his enthusiasm about the upcoming season. 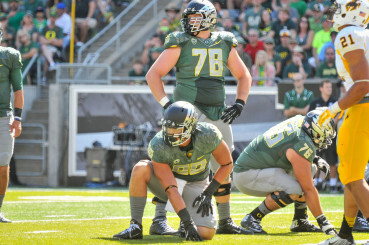 The Ducks will be hard pressed to repeat the historic season they had in 2014 considering the changes that are being made to the offensive line as well as the quarterback position. The quarterback battle has taken over headlines but Crosby and the offensive line will be key to protecting whoever is leading the offense in 2015. A two-sport athlete in high school, Crosby was a top two prospect from Nevada two years ago, one of the top 40 offensive linemen in the country who played defense as well. In 2013 he scored 33 tackles and seven sacks. That speed and mobility will be important as the Pac-12 is shaping up to be one of the toughest divisions in the nation. 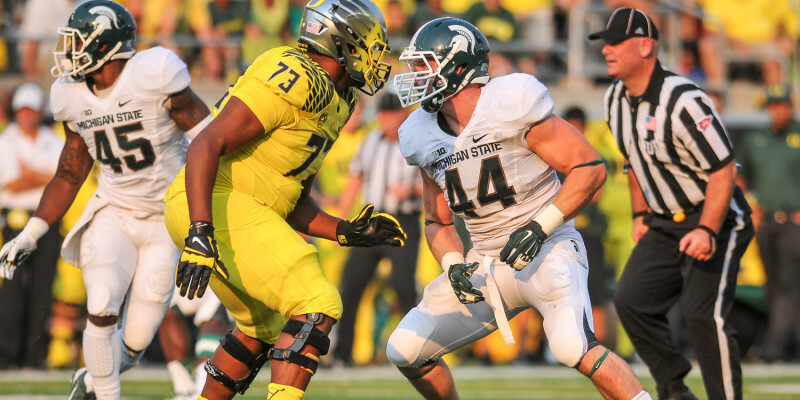 Before the season has even started most fans are already looking forward to marquee matchups against the likes of Michigan State on September 12 and USC on November 21; Crosby and the Ducks however are taking things one step at a time. It isn’t too early to set goals as a team but they are “just worry[ing] about today and [not focusing] too far ahead.” An exciting schedule is on hand for the Ducks but right now it’s time to focus on spring ball. If Crosby and the rest of the offensive line are already playing well as a group, the remainder of spring practice leading up the season opener against Eastern Washington on September 5 can only be a sign of greater things to come.